What do you get when you want a fast flavor filled GOLD medal recipe? 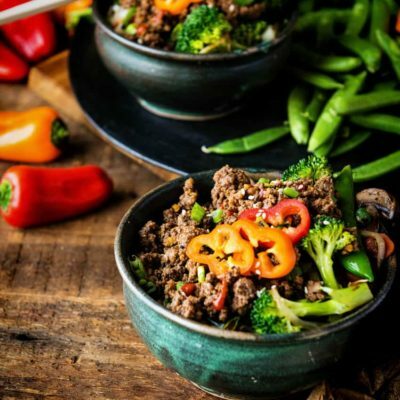 These healthy Korean Beef Bowls. With delicious USA Beef and tons of delicious veggies, it’s the kind of meal for all your aspiring winners. This post was created on behalf of the new grocery store hitting US soil – Lidl. As with all my posts, the thoughts and opinions expressed are all mine. Which means this killer Olympics inspired recipe was all mine. Yeah, make it. It’s that kinda good. Nerd Alert. Ok “Meat” nerd alert. As the resident meat maven on the block, you can imagine I take my market time seriously. I scan the aisles for deals and new products to feature so that you can tune into my Instagram feed and here for new ideas to keep you coming back to the kitchen all sorts of inspired. It’s almost a weird hobby. So, when a new shop opens up, ya’ll know I am the first to hit it up. As I noticed a new shop had opened, I popped over to check it out. I pushed my mini cart through the new Lidl that I saw pop up near me, checking out their prices, produce and meat. I noticed that Lidl is a streamlined model. Not with the overwhelming high shelves packed with 19 varieties of everything, but the slimmed down what you really need kind of market designed to get a hot meal on the table without making you have to pick between exactly which semolina flour brand is the perfect one for your family. It’s simple shopping. A quick tour showed me the outline and basics and a whole lot of products to make you rest easy. Their meat chiller was packed with all USA raised 100% Grass Fed Beef options that have been raised with the best care and hand selected by family farms. Things from grass fed 85% ground beef in quick 1 pound packages ($3.99 per 16oz pack – that’s 33% off from 2/15 – 2/21) to Steakhouse Naturals Rib Eyes ($5.99 per 10 oz pack – that’s 29% off 2/15 – 2/21), Chuck Roasts ($15.98 per 32 oz pack), sirloins ($4. 49) and Tenderloins ($ 9.99 per 8oz pack-) – all portioned perfectly for the family or individuals and ready to go in easy wet-aged packages. It was a quick grab and go on a busy work day for myself – with a little Olympic inspiration for my recipe. 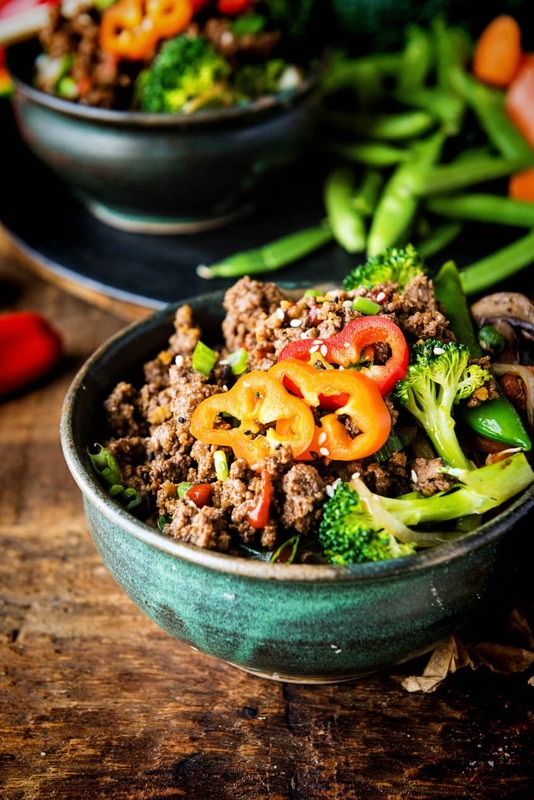 These Korean inspired beef bowls are quick and dangerously easy to pack a ton of bonus veggies into. Use up anything you happen to have in the fridge or keep it simple with just a few heads of broccoli. Bonus, if you are sticking to a whole30 (or maybe just looking to test the waters for it), this is an EASY recipe to convert to Whole30 compliant. I have included both options below for ya! 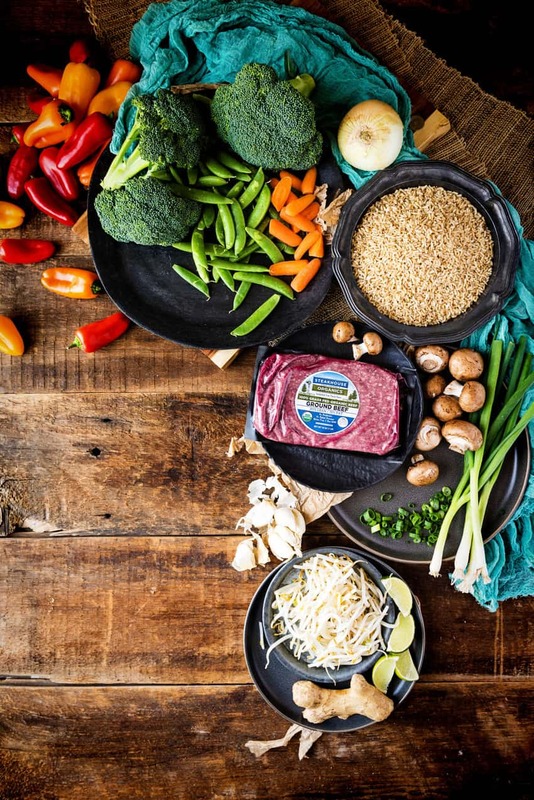 Is it your first time cooking with Grass Fed Beef? Check out these tips for cooking beef for cooking success! For ground beef, always temp your meat to medium for food safety. If cooking patties or meatballs, make sure the beef temps at 145 with an instant-read thermometer. If browning, crumble and make sure all sides are browned for safe consumption. Season as you go! Often times people don’t season their meat, and then dump a ton of salt on at the end, but if you season as you go, you will find the salt permeates the flavor more and you will season LESS when you serve the meal. Ground beef cooks quick – so for great BEEFY flavor – don’t use ground beef in long cooks – leave that for great cuts like the chuck roast. Stick to delicious burgers, quick tacos and other delicious fast weeknight meals for the best flavor! Brown beef in a large skillet over medium-high heat. Whisk the ginger, garlic, brown sugar, soy sauce, Worcestershire, sriracha, and beef stock together in a bowl. Pour over the ground beef, reduce heat to low and allow to cook until liquid has simmered down by half. In another skillet or wok, heat the sesame oil over medium-high heat and swirl to coat the pan. Add the veggies and stir-fry until softened to desired tenderness. I work the mushrooms and onions first, then add in veggies I like to keep crunchy like the broccoli and peas. Remove from heat. 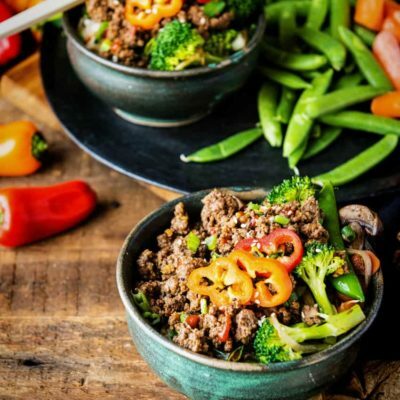 Allow everyone to scoop rice into their bowls and top with the ground beef and veggie mix. Garnish with sesame seeds, scallions, lime wedges and additional sriracha as desired. Enjoy. Whisk the ginger, garlic, cider, fish sauce, Sambal Oelek and beef stock together in a bowl. Pour over the ground beef, reduce heat to low and allow to cook until liquid has simmered down by half. In another skillet or wok, heat the sesame oil over medium high heat and swirl to coat the pan. Add the veggies and stir fry until softened to desired tenderness. I work the mushrooms and onions first, then add in veggies I like to keep crunchy like the broccoli and peas. Remove from heat. 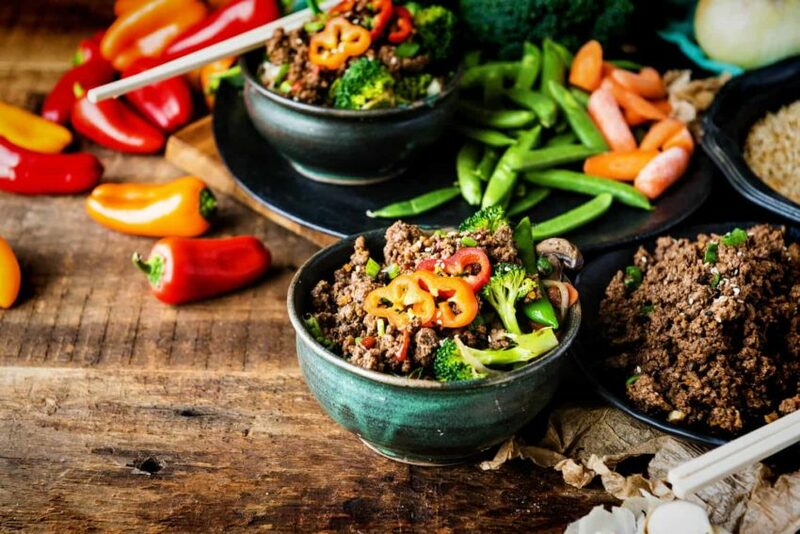 Allow everyone to scoop cauliflower rice into their bowls and top with the ground beef and veggie mix. It’ll be next year before one opens near me! I’ve got my jumbo token ready. Check their chocolates: the ones with hazelnuts, fruit (one of 4 varieties), and brandy. Delicious! I feel like you can judge the rest of a grocery store by the quality of the meat counter. And this does sound pretty killer.